Semtech Corporation (Nasdaq: SMTC), a leading supplier of high performance analog and mixed-signal semiconductors and advanced algorithms, is demonstrating its industry leading, innovative wireless and sensing solutions, LoRa® devices and wireless radio frequency (RF) technology (LoRa Technology) and smart proximity sensors, at Wearable USA in Santa Clara, Calif. from Nov. 15-16, booth V36. 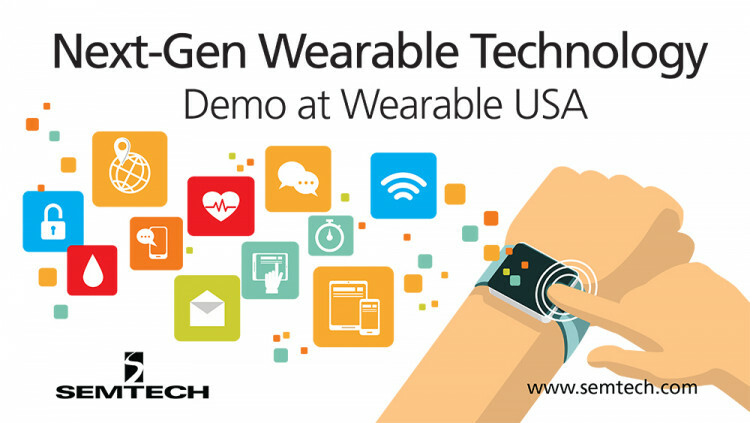 At Wearable USA, Semtech will demonstrate and showcase wearable technologies and trending IoT applications including smart watches and fitness trackers. LoRa Technology’s long-range, low-power capabilities are ideal for wearable technology that need secure transmission in a small foot print. Semtech’s ultra-small, low power smart capacitive sensor is a perfect solution used by wearable manufactures for touch control and human body detection. Semtech’s LoRa devices and wireless RF technology is a widely adopted long-range, low-power solution for IoT that gives telecom companies, IoT application makers and system integrators the feature set necessary to deploy low-cost, interoperable IoT networks, gateways, sensors, module products, and IoT services worldwide. IoT networks based on the LoRaWAN™ specification have been deployed in over 65 countries and Semtech is a founding member of the LoRa Alliance™, the fastest growing IoT Alliance for Low Power Wide Area Network applications. To learn more about how LoRa enables IoT, visit Semtech’s LoRa site and join the LoRa Community to access free training as well as an online industry catalog showcasing the products you need for building your ideal IoT application. Semtech’s smart sensing solution features best-in-class sensitivity for optimal human presence detection. It can not only be used as a touch input, but also a proximity human sensor telling wearable devices whether the device is being worn or not. Even under various environment factors such as temperature and humidity, the smart sensor can still provide the highest sensing resolution and most reliable measurement. Semtech’s smart sensing solution consumes ultra-low power, has ultra-small footprint, and is able to sense with small sensing area, so that it can be easily designed into the system with small internal space and limited power supply. All above features make Semtech’s smart sensor the ideal solution for the increasing demands of smart control in wearable devices.